@Anti-Matter So a bunch of indies and Animal Crossing? The indies you stated I'd expect announced in a Nindies Showcase before E3. Correct me, if im wrong. but arent we getting a Story of Season(thats what it's called in the west, but it's your preference) for Switch? i could of swore, i saw it from an official Nintendo Switch image. I called it Bokujou Monogatari for Japan version. And still no news about "Real" Harvest Moon for Switch. We got the Crappy Harvest Moon Light of Hope from Natsume. Publisher (Marvelous, I think) said they would figure out a way to bring the series back, this was like...what, 5 years ago or something? Because Only Animal Crossing for Switch , Yonder the Cloud Catcher Chronicles and Re:Legend are caught my attention most. I have no idea what upcoming Switch games that will be on my shopping list during this year, so i expect something that caught my attention so far. How about Re:Legend from Magnus Games ? Eh... nah. I stick with Rune Factory. ...Yeeeaaah, Rune Factory better. I never like chibi stuff. I'm looking forward to the Metroid Prime: Last Chance trailer Danger Close Studios will release. you guys don't think will see prime 4 at this year's E3? I think we might see a generic actiony trailer for Prime 4 but with very little gameplay, it'll then be just given the release date of 2019. I think Fire Emblem and Animal Crossing will be announced as their holiday 2018 games. Yoshi will be august 2018. A few HD remasters will be announced too. Probably Skyward Sword HD and I hope either Mario Sunshine or Xenoblade Chronicles. Playstation I think will steal the show with Last of Us 2 and FF7 remake gameplay. Spyro trilogy will be a big deal too. Only 3D platformers that have ever competed with Mario imo. I also think there will be Smash and Mario Tennis Aces tournaments at E3 that are streamed like last year's Splatoon 2, ARMS and Pokken DX tournaments were. @Grumblevolcano Sequels and ports, that would be quite boring, wouldn't it? I'm betting on at least one new IP. And Retro's project. It remains to be seen whether those two will be the same. I'm already hyped for E3 as well. There are some obvious candidates as to what we'll get to see, but I managed to get some hopes and dreams into my list as well. Just out of curiousity: why are people convinced that a new Super Mario Maker and Animal Crossing will release this year? Have I missed the rumours? @toiletduck There are some rumours though that's not why I'm predicting it. 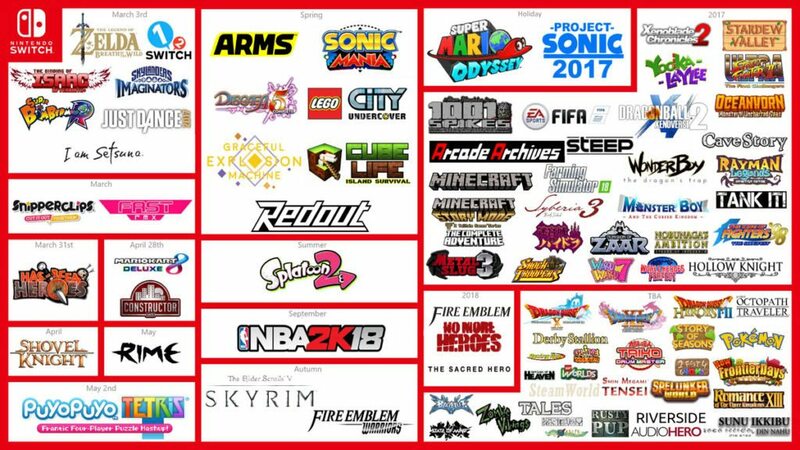 I think those are 2 games which need to be relatively early in the Switch's lifespan because of the nature of the games. Super Mario Maker thrives from the community creating levels and releasing it earlier in the lifespan means there's a much better collection of levels by the end. For Animal Crossing, all the main games have always been released within the first 2 years of a console's lifespan. -Pikmin 4 - Miyamoto said the game is closed to finished so why not? -Metroid Prime 4 sneak peek maybe? It would be foolish to announce Wii U ports at E3. That's basically guaranteeing that your system looks like old news and that no one will care about a port when there's so much new game news. It would be cool if Retro were making some sort of 3D adventure game or action RPG. The system's not getting any third party ones because they're all processing-intensive open world games, and those genres are where a large amount of the gaming audience is. It would be crazy if they were making a new kind of Mario RPG, but I'm not sure they even could after two mostly nonverbal Donkey Kong games. @Haru17 I wouldn't be surprised if they could, Prime 3 had some of the best serious writing in any Nintendo game. Which... isn't saying much, but still. They've had more than enough time to put together a game with a great story. I'd definitely like something like that from them as well, though I'm honestly not sure what we'll see happen. Wii U ports at E3 is almost certainly not going to happen, I agree. Those should be saved for the inevitable surprise at a later direct, not during E3 itself.